Home lighting control or automated lighting allows homeowners to adjust the levels and quality of all the lights in your home. Homeowners also have the luxury of turning on/off, dimming, or otherwise changing the lighting in any room of their home from central control. You can manage your Control4 lighting via switches, elegant touch panels or even your personal devices like your phone or tablet. One of our favorite ways to use lighting control is through scenes. These are collections of light settings in one area or room that are commonly used. The reason we love scenes is that it is so simple to set the right illumination for daily activities. Just press one button, and the right lights will turn on at the right levels. Speaking of lighting scenes, they are very valuable tools in home theater design. 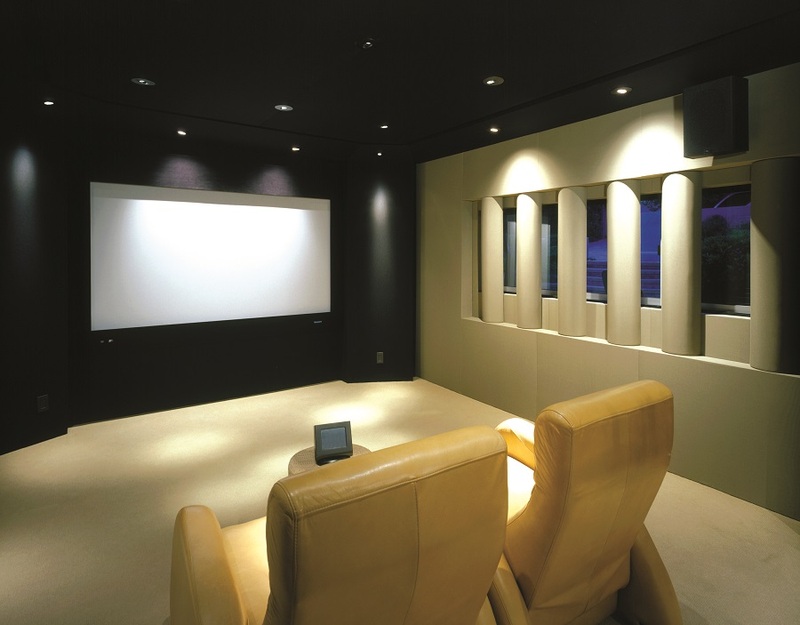 Work with your home theater installation team to program the lighting scenes that would be valuable to you. Here are a few examples. Of course, this is one of the most important scenes in your dedicated home theater. You can use lighting control to recreate the look and feel of a commercial theater. When you press play, your lights will automatically dim down to black. However, you probably do want to a few lights on along pathways or even scones on the wall so you can still see your snacks! If you have to use the bathroom in the middle of the movie, then use your lighting to find your way out of the room. When you press pause, your lighting system can dim up lights along the path so that you can comfortably make your way, but your viewing partners won’t be disturbed by too bright light. Maybe your home theater design includes a snack bar. Whenever you want to go up and grab something tasty, you shouldn’t have to turn on all the lights. Create a snack scene that illuminates the path to the snack bar and turns the lights on low in that area. Your home theater is a great way to bring date night home; you can both enjoy a drink without worrying about how to get safely home. Use your lighting control to make the experience even better than a commercial theater. You set your lights to levels that resemble candlelight or even incorporate some red tones. Once the movie is over, you’ll want to reset the room for your next viewing. When you press the “Clean-Up” button, all the lights will turn up to full intensity. That way you can clean up any mess that may have happened while you were fully immersed in your surround sound and 4K picture. To learn more about home theater design and how to have cinema-quality viewing experiences in your rec room or basement, contact Encore Audio Video today.